A numerical range facet is a type of SmartFacets™ displaying items that are ranges of values. Like for computed facet, a calculation (sum, average, minimum, or maximum) can also be made on the values found for the numerical field associated with the facet. 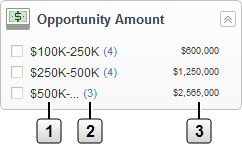 Example: When you index data from a customer relationship management (CRM) system, a numerical range facet can display ranges of Opportunity Amounts together with the number of opportunities and the total amount for each opportunity amount range. Note: Coveo .NET Front-End12.0.295+ (August 2013) The interval values in numerical range facets are automatically generated with nice rounded values that are dynamically updated based on the content returned by the index. For .NET search interfaces, numerical range facets need to be configured by a developer. The automatic ranges can be replaced by static ranges. Contact the Coveo Professional Services for assistance.